My cousin was in town recently for Thanksgiving. Although we are loosely related (my great-great-grandfather and her great-grandfather were brothers), we are almost exactly alike when it comes to food. She’s a foodie as much as I am so I was a bit surprised when she didn’t know about pop-ups that are springing up everywhere. I really wanted to go to Georgio’s for a pop-up but the timing didn’t work out and we ended up at Sompun Thai which unfortunately was passable at best. We’ve talked about doing something when she’s here next for Christmas and I hope we get to Georgio’s. In the meantime, Test Kitchen may be over (read about my last meal there with links to the 9 other great meals I’ve had there) and Ludobites is also on hiatus but that doesn’t mean there aren’t any more pop-ups. 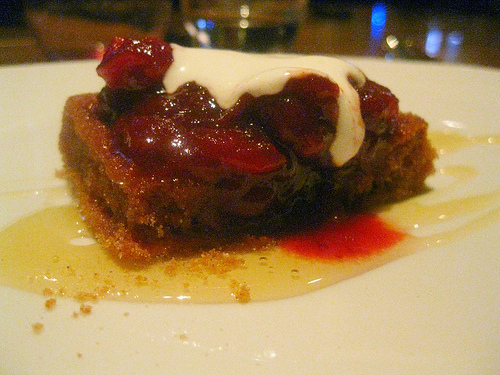 This past Monday and Tuesday welcomed another pop-up to LA– Magnum at Biergarten. Biergarten is a German-style brewpub serving Korean food. I haven’t been able to check it out before but definitely would like to go back soon. Read the Vixen’s account here regarding happy hour. Recently, Chef Joseph Mahon tersely tweeted he was no longer with Bastide and someone else was executing his menu (presumably until a new chef is hired). He and Sommelier David Haskell (formerly of Vertical Wine Bistro in Pasadena) presented a 5-course tasting with wine pairings. However, if you were interested in advance restaurant math, you could add another two courses for only $10 more. Naturally, I went with the seven courses for a mere $66. This included two free pairings with those two extra courses. I was traveling over the weekend and didn’t have time to study the menu so when I arrived, I really had no idea about what I was going to eat. I was pleased to hear it was a blend; a bit of French, some Asian and good ol’ American (fried chicken and a deep-fried waffle a la state or county fair style). Chef Joseph said he sourced 80% of the ingredients from the Korean market next door. We started with a light carrot pudding. 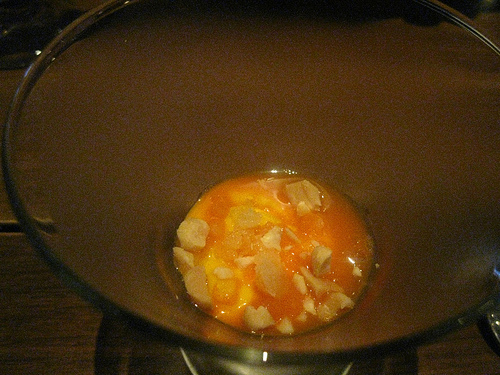 It was creamy punched up with an orange granita and rounded out with peanuts. It was a good way to start the meal. But the next course blew our minds. 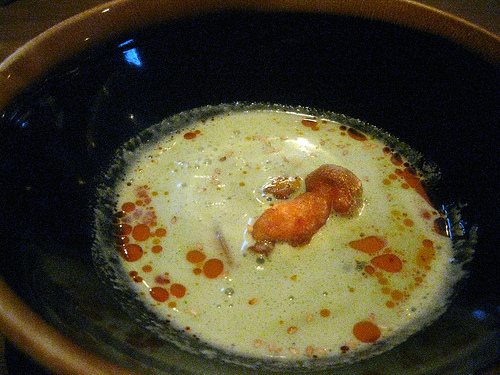 We loved the coconut soup with the mussels. And the mushroom done tempura style? Such great plating. 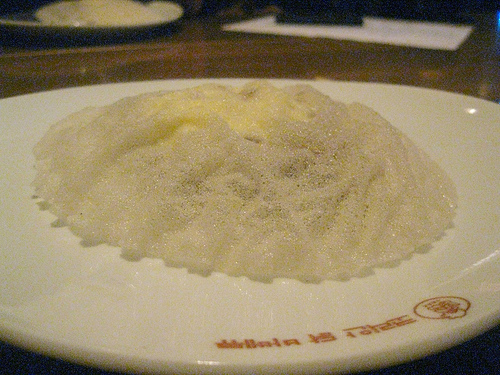 Up next was the wild mushrooms that came under a rice paper dome. I broke it into pieces and used it as a “chip” for the savory pork cheek and bearnaise mousse. We were starting to get full and I realized the portions seemed to be increasing. After the rich wild mushrooms course, we were treated to fried chicken (2 pieces), cured salmon (about a 2 oz piece) and a whole duck leg each. That’s a lot of protein! My chicken was slightly underfried so I would have liked it a bit crisper but it was still very yummy. 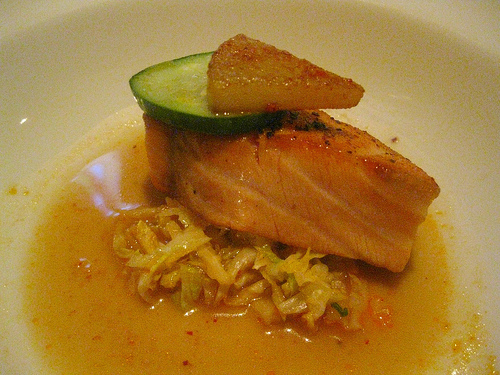 The salmon was absolutely perfect. Buttery, cooked just right and I loved the cabbage it came with. 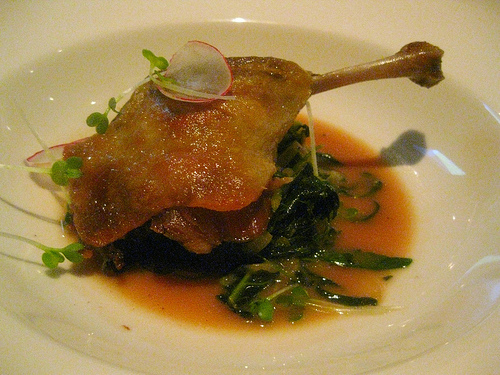 The duck confit was like an Asian-fied version. It wasn’t rich and actually a bit on the sweet side. The black beans looked more like azuki beans to me and were firm. I really enjoyed the chard but I love leafy greens. We had a colorful debate about the waffle and how it came to be- fried. The chef said he brought his waffle maker to Biergarten but obviously he couldn’t make waffles to order with that many tables. So he made them in advance and deep fried them to crisp them. With cranberries, honey and creme fraiche, it turned the waffle into something you mind find at the local county or state fair. It was delicious. I enjoyed the eclectic wine pairings (or wine, beer, soju and sake pairings as the case may be). David’s a great raconteur when it comes to how he thinks to pair wine with food. He explained the Cabernet Franc we had with the duck sucked on its own would have sucked. Some wines are really food wines- it takes food to bring out the wine’s real beauty. Tasting it, my mouth immediately puckered but drinking it with the duck, I feel an almost immediate alchemical change happening in my mouth. The wine smoothed out and it was a bit of a magic trick. 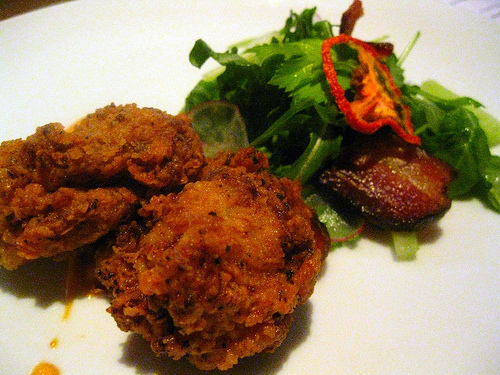 Chef Joseph hinted there may be another pop-up soon in January. I’ll be on the look-out!